Description: A limestone soldier is on a pedestal in front of the courthouse. 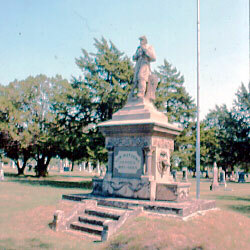 The granite base is inscribed: "Our Nations ~ Heroes ~ 1861 - 1865". The back reads "Erected ~ By The Children". 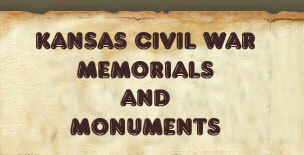 Description: A granite monument with a flagpole is located on the grounds of the court house. 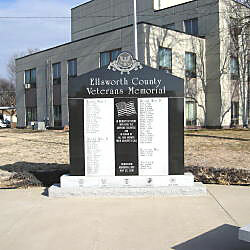 The inscription reads: "Ellsworth County ~ Veterans Memorial ~ In Memory Of Those ~ Who Gave The ~ Supreme Sacrifice ~ And ~ In Honor Of ~ All Who Answer ~ Their Country's Call ~ Dedicated ~ Memorial Day ~ May 28, 2001". 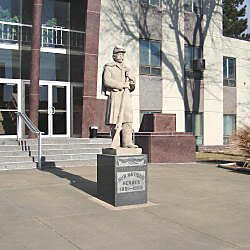 A bronze plaque is mounted on the plaza in front of the monument reading: "Erected By ~ The Donations Of ~ The Veterans Organizations ~ And Citizens Of ~ Ellsworth County". 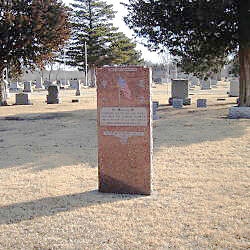 Description: A granite monument is mounted central to the Ellsworth cemetery. The inscription reads: "In Memory Of ~ Ellsworth County Men And Women ~ Who Made The Supreme Sacrifice ~ And In Honor Of All Who Served ~ That Freedom Might Live ~ Erected 1952 By American War Dads ~ Chapter 41". Description: A limestone base supports a granite soldier at parade rest. The base includes fountain pools fed by metal lion's head castings to supply water. 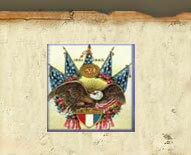 The base is engraved: "Our Nations ~ Heroes ~ 1861-1865". 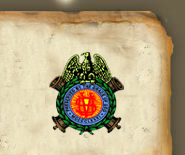 "Presented To The ~ G.A.R. No. 115 ~ By The W.R.C. No. 151 ~ May 30, 1902" and on the reverse side : "Knoebel And Marshall ~ Abilene Kan". 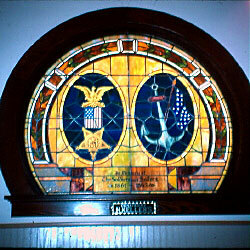 Description: A stained glass window in the Wilson Presbyterian Church includes a GAR medallion and an anchor. The dedication in the window reads: "In Memory Of ~ The Soldiers And Sailors ~ 1861 - 1865". A metal plaque below the window states: "Donated By ~ H. Kellers".